40 series torque converter maintenance is simple. If you have an old go kart torque converter that needs to be serviced, this article will show you how to do it step by step. In addition to cleaning, most old torque converters need new belts as the old ones tend to crack and become narrow (reducing low end torque and top end speed). You can get a new torque converter belt, as well as 40 series replacement parts here. 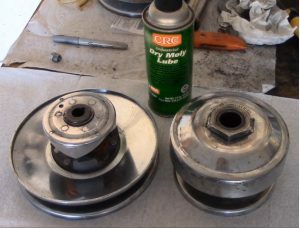 This video will show you how to disassemble, clean, lubricate, polish, and reassemble a comet 40 series torque converter. You will need simple hand tools, and some wire attachments to get rid of rust, dry molybdenum spray for lubrication. Just watch the video, it takes too damn long to explain it. If you found this information valuable, go ahead and like it, comment, and share. If you end up needing comet 40 series torque converter parts, you may be able to order what you need rather than replacing the whole unit. This is part of the maintenance section of KartFab. Hey, kart fab I have a question for you. Does adding a torque convertor make your go kart go faster. Tom, have a look at some mini buggies that are on the market. Heep the tie rods in the same plane (angle) as the a-arms with the steering wheel straight. You will need to center the rack and pinion. Hello, if I order the Deluxe Upgrade Live Axle kit is there a good way to add a reverse gear to my go kart? You can but i dont give out any instructions. The only reverse gear I know of is only rated for 8 hp. chinese for the trailmaster go karts. The driven unit of the torque converter is what attaches to the reverse gearbox. This is also on the same website that the parts kit is for the go kart parts in the plans. just gotta search reverse gearbox. could be a vacuum seal issue with intake gasket(s), jetting, or dirty carb. Think back to see if you changed anything, anything you touched. Hey kartfab I have a question I have an 07 Joyner with no engine I am trying to put a 440cc 18 HP duromax engine on it with a 40 series on it , in your opinion what sprocket and tire size would you use ? Do you think I’ll have a problem with the torque converter and the axel? Brilliant. Simple. Perfect! Thank you for taking the time. Behöver jag en 30 el 40 serie? 40 series is from 8-18 hp, 30 series is only 5-8 hp. If your belt is catching on the rivets, then you have a serious alignment problem. If you google “comet belt chart” you will notice that the center to center distance has almost no margin of error. My two cents? Your belt is too short or your center to center distance is too large for your belt. I have a predator hemi 212cc engine I’m upgrading. I’m assuming after the upgrades it will be in the 12-14 hp range. Would I need to upgrade the torque converter from a 30 series to a 40? No, you won’t be making that much HP typically unless you do a lot of modifications to alter your compression ratio and run it on race fuel. Also, the torque converters (30 or 40 series)are a bad idea for High rpm applications. If you are going to rev high, you are going to need a centrifugal clutch or disc clutch. How often should I clean and lub a 40 series clutch? Got a new 40 series and after about 10 hours total of driving time in a couple weeks it wants to hang up a little after driving it hard at slowing down. It pops back in place at almost stop. as often as it needs it. What you are describing could just be an issue with idle speed. If it takes time to pop back into place, then you may need to bump your idle rpms down. Thanks for your input, I found that the motor I have for the dune buggy is a Chinese motor, and found the new side case for the transmission, 114 dollars us. So I will be in business. Because that is what mounts to the rear of the frame. Now on to building a gokart with a predator engine. I just bought a frame of a I guess Bahamas style off road go cart, no use able engine. Has coil over shocks front and bac, rack and pinion steering, disc brakes, two seater, roll cage. Well built and heavy, took 4 guys to put it in the back of my truck. Knob by tires etc. Had a water cooled engine, but broken mounts,dual chanel drive to a live axel. I want to put a 16 or 18 horse motor with a series 40 torque converter. But how do I know that the axel will accommodate the torque converter? I can send a photo. Interested in your opinion. It’s Baha style, and had dual chain drive off of a motor I have never seen, with a transmission for forward and reverse. And probably not usable instead of a torque converter. check out diygokarts on google, they can answer your question because you will have a lot more! axle isnt the problem but gearing. Typically 6:1 gearing with 22″ or smaller rear tires is fine. I did some research on the motor, 250 cc water cooled Honda, not usable now, because the mount hole toward the rear of the engine near the live gear, is broken, and can be welded, and need to check engine usability. My question is what about air cooled motor and torque converter instead of the water cooled? The axle is bigger than 1 inch diameter, will a torque converter work, or do I need a different axel? My murray gokart briggs and stratton 6.5hp engine needs torque converter and mount. Im looking for parts and instructions or ideas. Like to surprise my son with a nice gift. What is differences in a 40 series and a 30 series torque converter? 30 series is for 5-8 hp engines, has either a 3/4″ or 1″ bore and is ok for most go kart applications. 40 is for 8-18 hp engines, has a 1″ bore, and is heavy duty.